Android Studio includes an APK Analyzer that provides immediate insight into the composition of your APK after the build process completes. Using the APK Analyzer can reduce the time you spend debugging issues with DEX files and resources within your app, and help reduce your APK size. It's also available from the command line with apkanalyzer. View the absolute and relative size of files in the APK, such as the DEX and Android resource files. Understand the composition of DEX files. Quickly view the final versions of files in the APK, such as the AndroidManifest.xml file. Perform a side-by-side comparison of two APKs. Drag an APK into the Editor window of Android Studio. Switch to the Project perspective in the Project window and then double-click the APK in the default build/output/apks/ directory. Select Build > Analyze APK in the menu bar and then select your APK. Important: When analyzing debug builds, use the APK created by selecting Build > Build APK or from the gradle commands. Clicking Run in the toolbar results in Instant Run-enabled APKs, which shouldn't be used with the APK Analyzer for optimization tasks because they are for development use only and load most resources dynamically. You can identify an Instant Run APK by the presence of an instant-run.zip file embedded within the APK. APKs are files that follow the ZIP file format. The APK Analyzer displays each file or folder as an entity with expansion functionality available to navigate into folders. The hierarchy of the entities mirrors the structure of the files and folders in the APK file. APK Analyzer shows raw file size and download file size values for each entity, as shown in figure 1. Raw File Size represents the unzipped size of the entity on disk while Download Size represents the estimated compressed size of the entity as it would be delivered by Google Play. The % of Total Download Size indicates the percentage of the APK's total download size the entity represents. If your project includes multiple AndroidManifest.xml files (such as for product flavors) or includes libraries that also provide a manifest file, they are merged into a single file in your APK. This manifest file is normally a binary file within the APK, but when selected in the APK Analyzer, the XML form of this entity is reconstructed and presented. This viewer allows you to understand any changes that might have been made to your app during the build. For example, you can see how the AndroidManifest.xml file from a library your application depends on was merged into the final AndroidManifest.xml file. Additionally, this viewer provides some lint capabilities, and warnings or errors appear in the top-right corner. Figure 2 shows an error being reported for the selected manifest file. APK Analyzer's DEX file viewer gives you immediate access to the underlying information in the DEX file(s) in your app. Class, package, total reference, and declaration counts are provided within the viewer, which can assist in deciding whether to use multidex or how to remove dependencies to get below the 64K DEX limit. Figure 3 depicts a medium-size app that is below the 64k DEX limit. Each package, class, and method inside the DEX file has counts listed in the Defined Method and Referenced Methods columns. The Referenced Methods column counts all methods that are referenced by the DEX file. This typically includes methods defined in your code, dependency libraries, and methods defined in standard Java and Android packages that the code uses—these are the methods counted toward the 64k method limit in each DEX file. The Defined Methods column counts only the methods that are defined in one of your DEX files, so this number is a subset of Referenced Methods. Note that when you package a dependency in your APK, the methods defined in the dependency add to both method counts. Also note that minification and Proguard shrinking can each also considerably change the contents of a DEX file after source code is compiled. Just above the Class list, APK Analyzer provides filters for viewing the contents of the selected DEX file. In the File list, select the classes.dex file. In the Class list, navigate to and select a class. Expand the class you selected. Toggle Show fields to show or hide the class fields. Toggle Show methods to show or hide the class methods. Toggle Show all referenced methods or fields to show or hide referenced packages, classes, methods, and fields. In the tree view, italicized nodes are references that do not have a definition in the selected DEX file. A DEX file can reference methods and fields that are defined in a different a file. For example System.out.println() is a reference to the println() method in the Android framework. Next to the filtering icons are the Proguard mapping icons. They are grayed out until you load a set of Proguard mapping files that add functionality to the DEX viewer, such as deobfuscating names (mapping.txt), showing nodes that were removed (usage.txt), and indicating nodes that cannot be removed (seeds.txt). The Proguard mapping files apply to APKs that were built with Proguard enabled, and must come from the same build that produced the APK. Navigate to the project folder that contains the mapping files and load all of the files, any combination of the files, or the folder that contains the files. 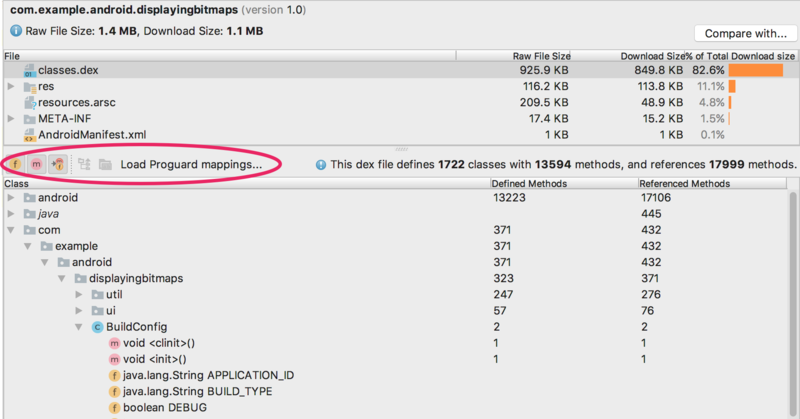 The mapping files are normally in project/app/build/outputs/mappings/release/. The file picker defaults to the release folder if it detects this project structure. First, the file picker checks for filenames that exactly match mapping.txt, seeds.txt, and usage.txt. Next, the file picker checks for filenames that contain the text mapping, usage, or seeds somewhere and end with .txt. For example release-seeds-1.10.15.txt is a match. seeds.txt: Nodes that the Proguard configuration prevents from being removed during shrinking are shown in bold. mapping.txt: Enables Deobfuscate names so you can restore the original names of nodes that were obfuscated by Proguard. For example, you can restore obfuscated node names like a, b, c to MyClass, MainActivity, and myMethod(). usage.txt: Enables Show removed nodes so you can show classes, methods, and fields that were removed by Proguard during shrinking. The restored nodes are shown in strikethrough. For more information about using Proguard to obfuscate and minimize your code, see Shrink your code and resources. The nodes in the Class list view have a context menu with the following options that let you see the bytecode, find usages, and display a dialog that shows Proguard rules that you can copy and paste for the selected node. Right-click any node in the Class list view to display its context menu. Generate Proguard Keep rule: Shows Proguard rules that you can copy and paste into your project Proguard configuration file to keep a given package, class, method, or field from being removed during the Proguard shrinking phase (figure 8). For more information, see Customize which code to keep. Various build tasks change the final entities in an APK file. For example, Proguard shrinking rules can alter your final code, and image resources can be overridden by resources in a product flavor. Viewing the final version of your files is easy with the APK Analyzer: Click the entity and a preview for the text or image entity appears below, as shown in figure 9. The APK Analyzer can also display various text and binary files. For instance, the resources.arsc entity viewer allows you to see the configuration-specific values such as language translations for a string resource. In figure 10, you can see the translations for each string resource. Load the version of the APK you are about to publish into the APK Analyzer. In the top-right corner of APK Analyzer, click Compare With. In the selection dialog, find the APK that was last published to your users and click OK.
A dialog similar to the one in figure 11 appears to help you assess the impact the update might have on users. Figure 11 shows the difference between a particular app's debug and release builds. Different build options are in use between these build types, which alter the underlying entities differently.